When visibility is crucial at your work site, our high visibility workwear will help maximise your personal protection. Our fabrics in fluorescent colours and reflective tapes meet the latest international standards and our high-quality demands ensure you’re visible in all light and weather conditions. Advanced material technologies together with good fit provide comfort and flexibility in all weathers – giving you everything you need to stay safe and efficient on the job. All our high visibility garments are certified according to European norms. This is a common way of dressing when you work in the service and transport business. You don't need to wear completely high-visibility clothing, yet you still have a need of enhanced visibility. Wear a pair of trousers class 1 with any top or combine with a jacket, t-shirt or sweather class 2 or 3 to reach a higher safety level. Being clearly visible at large construction sites can be crucial. Many craftsmen choose to wear garments with high visibility. You can combine one of our class 1 craftsman trousers with a sweatshirt or jacket class 2 or 3 to get the highest protection. For anyone working on roads, railroads and other places where staying alive is dependent on being sufficiently visible, this is the way to go. For these types of jobs there are strict regulations on how to dress and we can provide a wide range of certified garments to guarantee the highest class 3 protection. When temperatures rises you can choose a pair of high vis shorts or pirate trousers. Here together with a comfortable sweatshirt class 3. Always choose the same safety class on the shirt you wear underneath to obtain the same safety level even if you want to take off yout sweatshirt or jacket during the day. 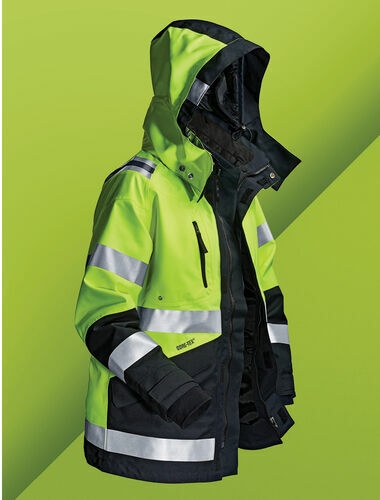 For the cold months of the year we have lined high vis garments protecting you against cold, wind and snow. You can for example choose our Airtech-products in water- and windproof material with high breathability. If you need something extra durable go with our garments in polydex shown above. Easy care material that is dirt, oil and water repellent. 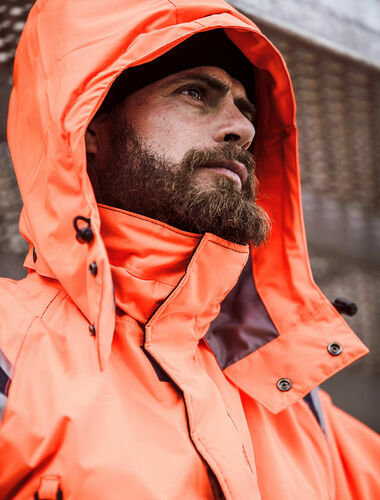 For maximum weather protection during spring, autumn and winter we have functional GORE-TEX products that are completely water- and windproof with high breathability. The highest quality with long life span. PLU är huvudmaterial för vår ofodrade kollektion. PLU är ett fluorescerande material med väl beprövad slitstyrka och komfort. Materialet är av 80% polyester, 20% bomull, där bomullen ligger på insidan av tyget och ger extra komfort närmast huden. Det är dessutom behandlat för att vara smuts-, olje- och vattenavvisande. Vi kombinerar detta med vår LUXE- kvalitet på ytor som är mer utsatta för smuts – ett slitstarkt och bekvämt material av 65% polyester och 35% bomull. Materialen och reflexerna är utvalda för att klara våra höga kvalitetskrav. Alla PLU-plagg är testade för industritvätt och klarar minst 50 tvättar i 85°. Alla plagg är OEKO-TEX®-certifierade. A completely water- and windproof GORE-TEX material with high breathability carefully tested to provide the best function and quality with long life span. Tha material withstands 28 000 mm water column in GORE's own tests. hold a water column hög andasfunktion, norggrant testat för bästa funktion och kvalitet med lång livslängd. Materialet klarar en vattenpelare på 28 000 mm i Gores egna tester (oberoende testinsitut testar endast upp till 10 000 mm) och 10 000 mm vattenpelare även efter 35 industritvättar i 60 grader med bibehållen funktion. Polydex is a very durable, colourfast and easycare material made of 100% polyester. The garment is dirt-, oil- and water-repellent. The soft brushed inside provides excellent comfort. TH is a durable material of 70% polyester and 30% cotton. Dirt- oil and water repellent. Fristads Airtech® is a wind- and waterproof material protecting against cold, wind and snow. The material is also highly breathable and keeps you dry and comfortable by transporting excess heat. A soft and flexible PU-coated stretch material providing great freedom of movement. Our garments in RU have welded seams to keep the rain out. All our garments are certified according to the standard for high visibility garments, EN ISO 20471. Apart from the products’ EN ISO 20471 certification, all the garments are tested in our laboratory to provide all of our users the maximum possible safety. 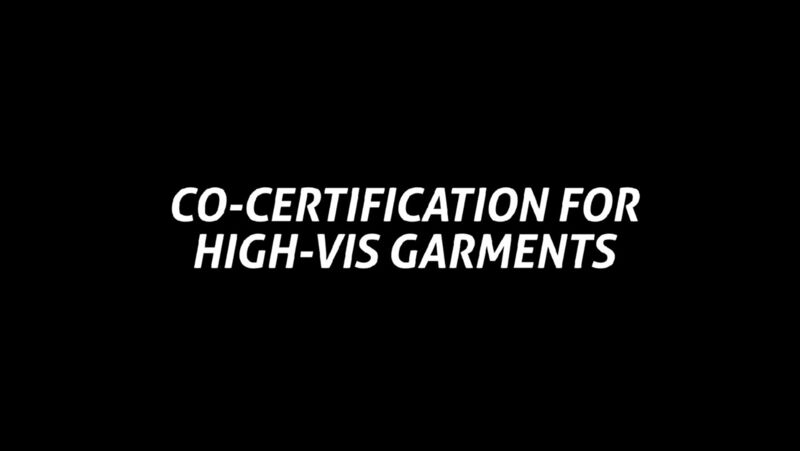 All high visibility garments are certified according to EN ISO 20471 and are divided into three different classes – 1, 2 and 3 – depending on how visible they are. With Frisatds safety system for high-vis clothing we have certified our garments together so you conviently can see which garments to combine to reach the highest safety level, class 3. Here you can download our a quick reference guide, which will easily show how to combine your garments to obtain the requested visibility class. All garments have been given a specific code, based on type of garment and classification, for example U3 or T4. 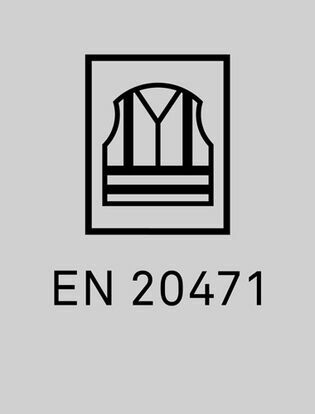 The code is shown as a symbol in the product information and in the CE label in the garment. High visibility clothing has fluorescent areas and reflective material conforming to certification requirements according to three different classes. Class 3 is the highest safety class. Garments that are certified according to class 3 can be combined with any other garment, as long as these do not cover the high visibility garment’s fluorescent or reflective areas. Look in the table below to determine the class required. On garments personalised with company logos, it is important to ensure that the logo does not obscure too great a proportion of the fluorescent area. This table will help you determine how large your logo can be. The total flourescent area must be at least 0.8 m2 to conform with class 3.